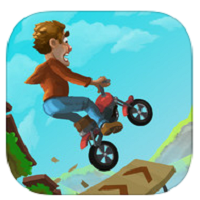 Fail Hard is a physics based stunt game where an aspiring stuntman has to go through several obstacles on his motorbike. 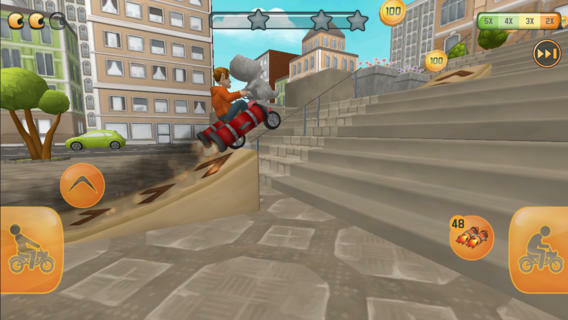 Unlike other stunt games for the iOS and Android, developer Fingersoft has paid attention to the controls so Johnny the stuntman is easier to control. The controls in Fail Hard are very intuitive and easy to learn, as you just need to press on the left side of the screen to lean backwards and speed up, and press the right side to lean forward while your bike is in mid air. Once you get accustomed to the controls it’s a breeze to play Fail Hard. The level design is very good, and you can do a double jump by pressing the jump button twice, and it gives you different ways of going through a level. This is a nice feature that will provide Fail Hard with lots of replay value, and it will give you several opportunities to grab those coins necessary to unlock a level. Because this is a physics based game the challenges are a bit harder to overcome but it is by no means impossible. Fail Hard adds a lot of variety to the levels and gameplay, and there’s even a level where Johnny has to use makeshift wings or a rocket. In addition, the level environments are interactive and have different facets, so it’s great as a casual game. If you’re looking for a fun entertaining game then this is a good choice, as it combines entertainment and challenges in a way that few titles have done.